Rooted in a democratic struggle that ended British rule in the subcontinent, there was something remarkable about Pakistan’s emergence on August 14, 1947 as a sovereign Muslim state. This was as much reflected in the founding father Muhammad Ali Jinnah’s address to Pakistan’s first Constituent Assembly as in its national anthem and flag celebrating Pakistan’s founding moment. 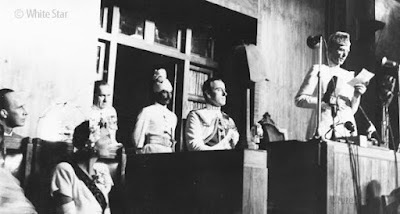 Jinnah’s speech on August 11, 1947 set the direction for Pakistan as a modern democratic state, where religion was a personal matter that had “nothing to do with the business of the state”, and people could creatively rework a divisive past for a promising future. At the same time, the inclusive spirit of a South Asian Muslim identity was reflected, on the one hand, in the first national anthem composed by Jagan Nath Azad, a scholar of Indo-Persian culture, and on the other hand, in a flag that celebrated Pakistan’s three percent religious minorities by giving them twenty five percent of the flag’s space — its white section. Indeed, Zulfikar Ali Bhutto’s populist slogan of “Islam, Democracy and Socialism” that gave him a landslide win in Pakistan’s first general elections held in 1970 also reflected the eclectic spirit of Pakistan’s South Asian Muslim identity. However, General Zia-ul Haq, who toppled Bhutto’s government in a military coup in 1977 and had him hanged two years later, set Pakistan on a different track that eroded the South Asian spirit of its identity. Lacking a political or social base of his own other than the army, Zia carved out a constituency for himself through a Saudi-backed politics of ‘Islamisation’ that infused Islamic conservatism in the state and society and co-opted religio-political parties, including the Jama’at-e Islami that had historically stood in opposition to Jinnah and Pakistan. Moreover, Soviet military intervention in Afghanistan in support of Kabul’s Marxist regime in 1979 helped in entrenching General Zia’s regime and turning Pakistan into “America’s most allied ally” as a Cold War frontline state. Indeed, if the Cold War had given General Zia a shortcut to legitimacy on the international front, the Afghan jihad enabled Zia to stake Pakistan’s future on the jihadi politics in Afghanistan , giving rise to a plethora of home-grown militant outfits. Clearly, the upshot of the US-Saudi backed Afghan jihad in a regional context shaken by Shia revivalist Ayatollahs of the Iranian revolution had fateful consequences for Pakistan. At the same time, with the virtual collapse of state education, religious schools linked with jihadi outfits rapidly expanded as breeders of a violent jihadi culture that eclipsed Pakistan’s South Asian identity while promoting an ‘Arabist shift’ — a tendency to view the Arab as the only ‘real’/pure Muslim, and then using this trope of purity as a self-righteous weapon for recasting the present in a glorified imaginary of a triumphal Arab past. Such reasoning is reflected in a detained Pakistani suicide bomber’s interview on Geo Television on July 2, 2009. The would-be bomber justified the killing of innocent children and citizens in the ongoing spate of suicide bombings by invoking the fatwa of “a great Arab cleric”, to the effect that those who died in the bombings were not innocent victims as they did not support Taliban’s jihad. Indeed, back in the 1990s when Pakistan helped Taliban’s rise to power in Afghanistan, Talibanic Islam became virtually synonymous with Osama bin Laden and Al Qaeda through fusion with Wahhabi-Salafi radicalism, even as Peshawar became “the capital of the Islamic world”, as noted by Al Qaeda strategist Abu Mus’ab al-Suri in Brynjar Lia’s Architect of Global Jihad: The Life of Al Qaeda Strategist Abu Mus’ab al- Suri. (Hurst. London. 2007) According to al Suri, “every ongoing discussion and debate (in Peshawar) quickly spread out to the rest of the world, through audio communiqués, books, leaflets, audiocassettes, and through couriers and visitors”. Moreover, if the founding moment of Indo-Persian culture was rooted in the 11th century publication of Kashf ul Mahjub, (The Unveiling of the Veiled), a treatise on Sufism by Lahore’s patron saint Ali Osman Hujwiri or Data Ganj Baksh as he is popularly known across the country, the publication in Peshawar of al Suri’s The Experience and Lessons of the Islamic Jihadi Revolution in 1991 might well have signalled the internationalisation of the Arabist shift in Pakistan. At the same time, Arab and Pakistani jihadis continued to flourish in the training camps of Afghanistan and Pakistani-administered Kashmir after Zia’s death and Soviet withdrawal from Afghanistan, even as Pakistan briefly realised its dream of gaining ‘strategic depth’ in Afghanistan under Taliban rule. However, all this changed following the September 11, 2001 suicide attacks on the United States, masterminded by Osama bin Laden’s Al Qaeda that Taliban had hosted in their Islamic Emirate. And although the invasion by US and NATO forces in October 2001 led to the rout of the Taliban and Al Qaeda in Afghanistan, this further radicalised Pakistan’s Islamist groups, even as the Taliban and Al Qaeda sought refuge in Pakistan. Indeed, most Pakistanis regarded the Taliban as ‘true Muslims’ and bin Laden a ‘hero of Islam’, thereby enabling the terrorists to exploit local hospitality in Pakistan. The existential threat that Pakistan faces is not only because of the Taliban per se, but also a complicit culture largely blurring the boundaries between ‘extremist’ and ‘mainstream’ in the Islamist spectrum. However, a sea change has occurred in Pakistan’s public perceptions of Al Qaeda and the Taliban since May 2009, after the Pakistan Army was finally compelled to crush the Taliban insurgency. Even so, military action against the Taliban would remain inconclusive without socio-economic and educational measures for winning “hearts and minds”, especially of the people displaced by recent fighting. At the same time, such measures should aim at promoting a new political culture in sync with Pakistan’s founding moment, summed up by Jinnah’s speech to the Constituent Assembly. Indeed, reclamation of Pakistan’s South Asian Muslim identity, so poignantly reflected in Jinnah’s speech, is as crucial for the survival of a democratic Pakistan as the battle for defeating the Taliban.